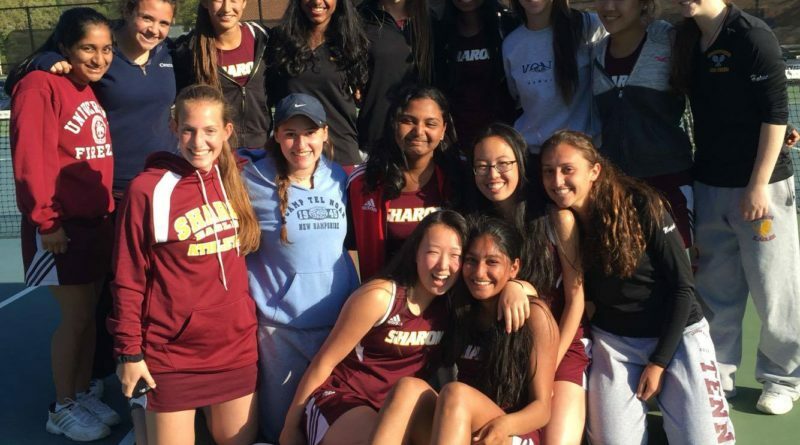 FOXBORO – By winning three of the five matches, the 15-0 SHS Girls Tennis team squeaked past Foxboro High to clinch the top spot in the Hockomock League. Sharon has one game remaining, against Canton, but they have mathematically earned the Hockomock title with Wednesday’s win. “We have had a good run this season,” senior captain Robyn Rapaport said on the bus after the game. “Our team dynamic is great and we’re expecting to make it far in the state tournament,” Rapaport added to the tune of cheers from her teammates. The Eagles were led by doubles tandem Pooja Puttigampala and Michal Kondratiev, the sophomore duo of Katie Merpot and Rithika Neti, and second singles freshman Napur Shulka. “I love this team,” senior captain Michal Kondratiev said after the game. The Eagles have lost just nine of their 75 matches this season. Sharon will face the 6-8 Canton Bulldogs in the regular season finale on Monday.